"This is a healthy alternative for the typical saturated fatty refried beans. Don't let the time scare you off. I soak them while I sleep and cook them during the day, so by dinner it is only 10 minutes from stove top to table. Not much longer than preparing a processed can product." 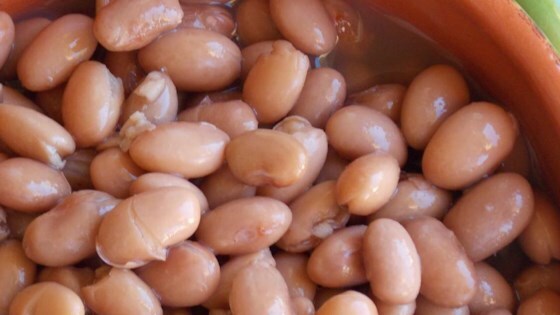 Place beans in a slow cooker and cover with 8 cups water; soak for 8 to 10 hours. Drain and rinse beans and return to slow cooker; top with 8 cups fresh water. Cook beans on Low for 8 to 10 hours. Drain. Combine 1/2 cup water, beans, olive oil, salt, and pepper in a skillet over medium heat; mash beans to desired consistency. Easy, healthy, tastes very natural. I love it! I added a few chunks of onion and a few cloves of garlic when starting to slow cook to add a little more healthy flavoring. YUM! I had to improvise the amounts and there was too much oil. Easy recipe however. The beans are easy to prepare. I added diced jalapeno and onions to the slow cooker. I didn't mash them since they were great as is. So simple, delicious and healthy! Beans are perfectly tender! Thanks so much!